Every weekday morning hurrying tech workers rush out, hundreds at a time, from Shoreditch High Street station in East London, turning left down Bethnal Green Road, past Boxpark Shoreditch, clutching cups of take-away coffee, ready for eight hours of keyboard-stabbing. None of them realises, as they head towards their desks and computers, that as they stride towards the road junction they are stepping through the ghosts of burly labourers in long leather aprons and red stocking caps: that where today they are dodging buses, cars and lorries as they try to cross the road, if they fell back two and a half centuries through a wormhole in time they would be dodging men rolling butts and hogsheads of beer, and skirting vats filled with maturing porter, the air carrying the satisfying scents of hops and malt rather than diesel exhaust. More than 150 years of sometimes frenetic development has altered swaths of London’s streetscape so much that plotting what once stood where has seemed sometimes impossible. This is particularly true in Shoreditch, where the driving through of Commercial Street and Great Eastern Street and the building of the Bishopsgate rail terminus in the 19th century meant streets and buildings were rubbed from existence like timetravellers who murdered their grandfathers. Happily, it is getting easier to reimagine the past, with websites now running that overlay and underlay old maps from earlier centuries on modern satellite photographs. 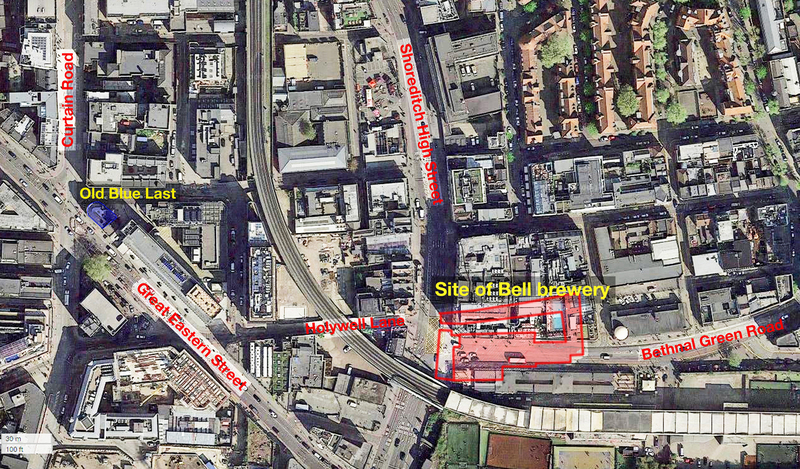 Thus, through the artful alliance of messers Horwood ( 18th-century mapmaker), Bryn and Page (20th-century Google-makers), we can say that the long-disappeared Bell Brewery, for a couple of centuries credited (wrongly) as the place where porter was invented, was slap where Bethnal Green Road now meets Shoreditch High Street. Stand in the box junction here with the Pret sandwich shop at your back and you are staring straight down where the entrance to the brewery yard was – now covered by the eight-storey Tea Building, once a bacon-curing factory, then a tea warehouse, now studios and offices. Don’t stand in the road too long pondering the past, though, or you’ll get either a No 26 bus or a hipster on a fixed-wheel bicycle up the jacksie. Just over 250 yards west of the site of the former brewery is the Old Blue Last, which was once a Bell Brewery tied house. (A last is the foot-shaped cobbler’s form over which he constructs a shoe.) 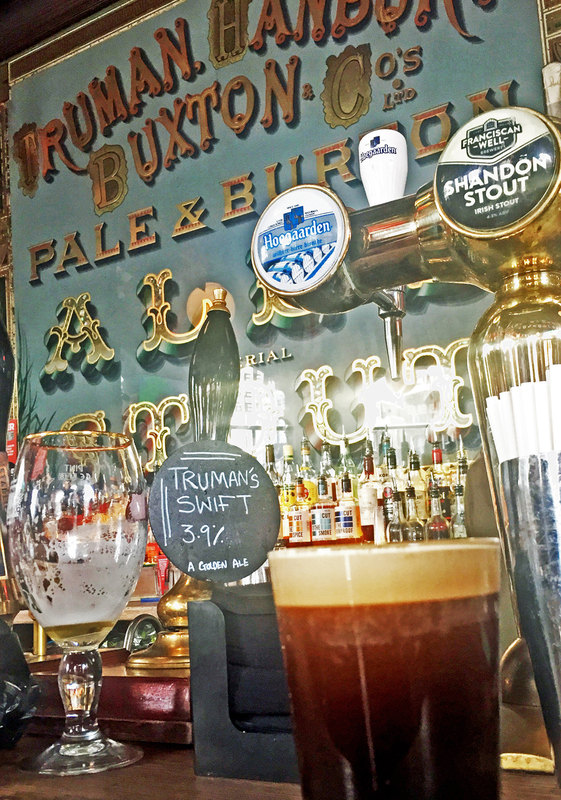 It passed into the hands of Truman’s of the nearby Black Eagle brewery in Brick Lane in 1816 when the men then running the Bell Brewery, Thomas Marlborough Pryor and Robert Pryor, members of a family of Quaker brewers and maltsters from Baldock in Hertfordshire, unable to renew their lease on the brewery site, instead merged their business with Truman’s. 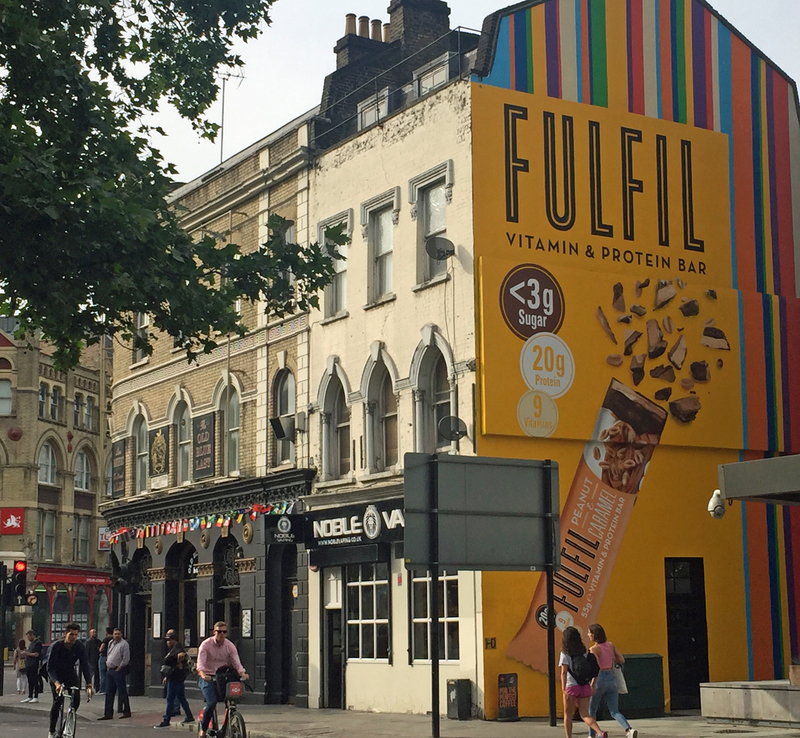 The Old Blue Last today: is the sign claiming the pub was the first to have sold porter hidden under that advert for vitamin bars? 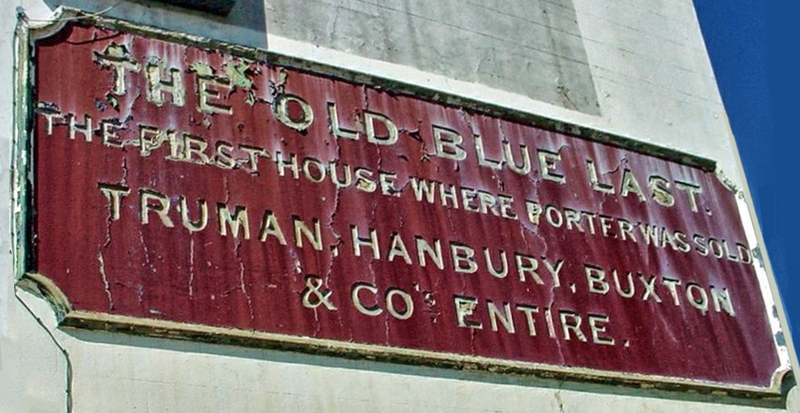 The original Blue Last was demolished in 1876 when Great Eastern Street was built, and a new pub erected in its place on what was now a corner site. On the back wall, visible from Great Eastern Street, Truman’s placed a large sign repeating the claim that the pub was “the first house where porter was sold.” I probably first drank in the pub in the 1980s, when both it and Shoreditch were run-down and scruffy: if the Blue Last didn’t actually had a stripper performing occasionally itself, there were several pubs nearby that did. I was there for the history, of course, hem hem, and additionally the Blue Last was handily close both for the Pitfield beer shop nearby, one of the few retailers of rare and obscure beers at the time, and the many typesetting firms in the area around the Old Street roundabout, which made Shoreditch and Hoxton a designery hangout long before any coms had been dotted. At least two magazine companies I worked for had their typesetting done in the area, which meant, since Sir Tim Berners-Lee was still but a lad with dreams, taking a taxi over from the office in West London to pass proofs. Some time in the past ten years the “first porter pub” sign seems to have vanished from the Blue Last’s back wall, or been painted over/covered up. However, there is still an enormous Truman’s mirror ruling the back-bar area, and meanwhile the fortunes of both the Blue Last and Shoreditch have risen and risen as it and its locality have become hipster havens. There wasn’t a porter on sale when I called by a few weeks ago, but they did have a draught stout that wasn’t Guinness, and since I was looking for some liquid history, that was welcome enough.